We've made our Honeybell Pack even better with this twist on the classic deluxe style. 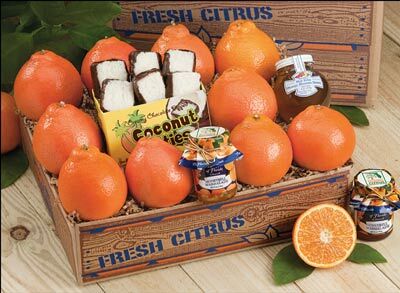 Along with our sweetest and juiciest fruit, the deluxe Honeybell assortment includes a box of Chocolate-dipped Coconut Patties, a jar of Orange Blossom Honey and two jars of authentic Honeybell Marmalade. Honeybell Deluxe - as good as it gets! Sign up to be notified when Deluxe Bells are in season. The Honeybell Deluxe Style Gift Pack is available January to February. It can be shipped to most of the lower 48 US states and eastern Canada. The pack can not be shipped to Arizona, California, Louisiana, Texas and parts of Nevada and Oklahoma due to USDA regulations.